We sometimes don’t know where our Soul has gone. We have stopped paying attention to it and we have become occupied by distractions that are often intentional. The media woven world is full of these. I found that by filming the raindrops in the pond in the rainforest, I was able to distill distractions and cleanse my over active Mind allowing a much better space for my Soul. 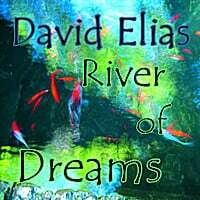 River of Dreams is largely a writing and song about loss and grief. It describes water in the form of rivers and tears and loss in the forms of shadows and metallic skies. My song “River of Dreams” then seemed to fit the mediative pond in the forest with raindrops falling into it creating dreamlike patterns of reflection of the forest trees nearby. That is how the video came to be. This entry was posted in music, photography, poetry, rainforest, video and tagged dreams, grief, Hawaii, Mind, pond, rain, rainforest, river, Soul, subconscious on September 9, 2013 by david elias.